This morning I got up at 5:48 am. If you don’t know me personally, you may not know how odd that is. I went to bed around midnight and woke up at 5:48 am. Which, on west-coast time is 2:48 am. I’m on east coast time right now because I’m home visiting my family in Indianapolis. Normally, it takes me at least 20 minutes to get out of bed. If I get up early like this, I fall right back asleep once I realize what time it is. But for some reason this morning, I couldn’t. It was the type of wake up where you are 200% awake. I’ve gone through days where at my most awake, I felt less awake than I did this early morning. It was like the caffeine from my afternoon double shot of espresso hit me all at once. Except that I hadn’t had a double shot of espresso. At least not in the real world. Maybe in dreamland. But I’m pretty sure I was just grocery shopping in my dream. Come to think of it, maybe my dream was so boring, my mind was like “ANYTHING ELSE” and made me wide awake. Who knows. I puttered around my house hoping to catch my dad before he went to work. Too late. It was totally dark out but his car was already gone. I saw a cat wandering around our front yard. I walked back upstairs to try and sleep again but couldn’t. I decided to go out on the front porch and pet the cat. My family has never bought a cat, but we’ve had two in my lifetime. We choose dogs. We are chosen by cats. I’ve heard tales of BK’s friendliness and cuddliness for months. I was actually excited to meet him. Because he’s still technically a stray, I was a little worried maybe he’d move on by the time I came around. But, sure enough, when we pulled into the driveway at midnight from the airport on Tuesday, there was Black Kitty on the porch waiting to greet us. So I thought I’d go outside to let him keep me company. It’d be a win/win. He gets attention, which he wanted, and I get another warm body that’s awake, which I wanted. I sat on the porch and looked for him but didn’t see him. I called for him a little bit but he wasn’t around. And he’s a cat. They don’t come when you call them. Especially when you don’t have a name beyond a basic description. I thought about going back inside, then I heard the crickets. I forgot how loud the crickets are in Indiana in the darkness. So I sat down, smelled the fresh, humid, morning air and listened to the familiar sounds of the midwest in the early morning hours. I love my new home, Los Angeles. I love the smells and sights and sounds there. But they’re different. They bring out different emotions. Indiana smells have a thousand past memories attached to them. I just sat there taking them each in with every breath. I sat on my porch that I’ve known my entire life and looked around. It was so peaceful. I know this place. I know these smells. I know these people. I understand it. It was that perfect twilight time just before the world wakes up and corrupts the quiet. Very few people (like my dad) are up and about during these hours. I am rarely up during these hours. It was a treat and I let myself enjoy every moment. I still wanted to pet that cat. I thought that I could enjoy the quiet smells and sounds with a warm cat in my lap. I heard the sound of another cat meowing in the distance. I figured it was Black Kitty upset nobody was around to pet it. “I’m right here, silly!” I kept thinking and called out for him a couple times so he knew. But he didn’t come. Because he’s a cat. Who isn’t mine. And doesn’t know me. Didn’t stop me from being insulted, of course. I stayed on the porch for a long time thinking I’d go inside again when the crickets sounds died down. If the cat didn’t want attention, I wasn’t going to sit around and wait for him. But, I really liked the cricket sounds and wasn’t in a hurry to go inside and miss the symphony. So I just stayed there, took deep breaths, and got lost in my own thoughts and world. As the sun started to rise, I came to terms with the fact that I would not get my alone time to bond with the supposedly friendly black cat. I wished my parents would just let him come inside already so I could have pet him on the couch and fallen back asleep. They won’t let him yet because they’re not ready to commit to him. They just got out of a cat-lationship. They know hurt it can cause in the end. The timing has to be right for them to decide to get another cat. Even though this cat has clearly already decided he’s family, my parents feed him, give him treats, and spend hours petting him…they’re not ready to commit to another cat. My parents have been around the block. They understand these things better. They know that committing to a cat is a huge emotional investment. They know the heartache it can cause. They know the responsibility it entails. They understand the depth of the investment. I take longer to catch onto these things. I thought about all that as I got ready to go inside. I respected their patience and realized I need to employ it myself in more ways in my life. Just because a cat is around and gives you attention and clearly thinks it wants in the house, doesn’t mean it’s the right timing yet to let it in the house. When the time is right, it will be obvious to everyone. See, I get scared the cat will change its mind and run away. I feel like you’ve got to “strike while the iron is hot” and act on impulse. I’m convinced if some other home sees this friendly cat and they let it in, we lose the chance to have a sweet cat. But my parents are okay with that. They can love and let go. They understand that the cat is free to go wherever it wants. He’s not our cat. Not yet. If it chooses to stick around, and they decide the timing is right, he will become our cat. But until then, he’s free to do whatever he wants. He may join me on the porch or he may continue to chase mice three doors down. He does whatever he wants. He doesn’t have to answer to me. I’m not committed to him. He’s not my cat. I’m not his owner. I’m starting to understand that concept better now. In a lot of areas of my life. As the sun came up and the crickets got quieter, I continued to hear that cat complaining a few doors down and I thought “Well, I tried, kitty. 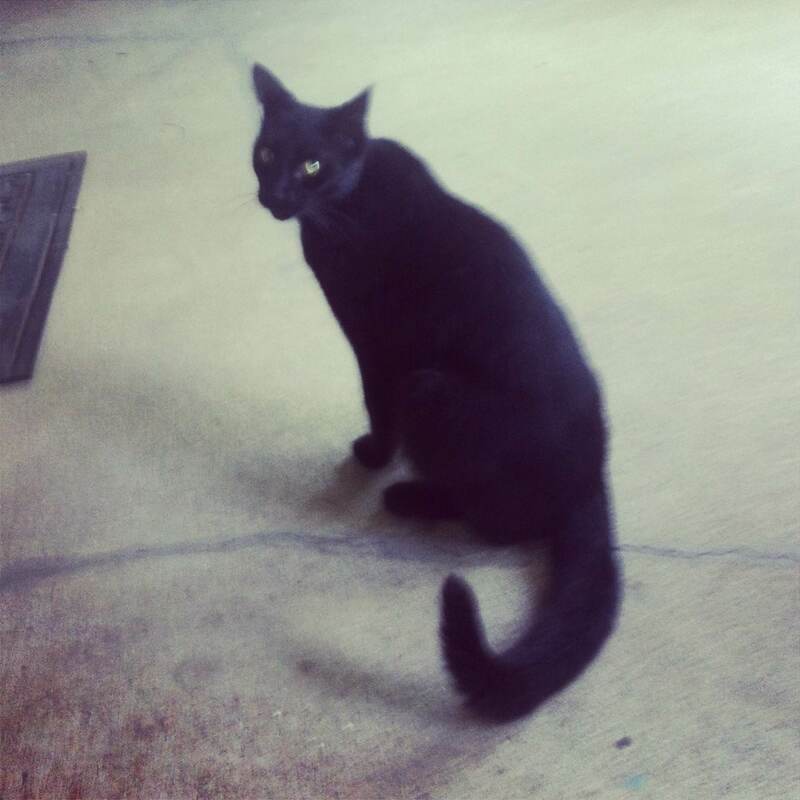 Maybe next time.” Just as I stood up to go inside, Black Kitty joined me on the porch. He wasn’t the cat that was complaining. He was just around somewhere quietly chillin, doing his own thing. He seemed excited to have someone to pet him. He knew why I was there. And let me tell you guys, that is a friendly, sweet, cuddly cat. He lets you pet his belly. A stray cat that lets you pet his belly! Amazing! I think I enjoyed petting him even more because the timing was better. I had the right attitude about it. I didn’t need to pet a cat for company. I enjoyed a quiet morning to myself and had let go of needing to pet him. I pet him because I wanted to. Though I thought I could concentrate on both the smells and sounds outside and the cat, it turns out I got completely one-track-minded when the cat was around and only focused on him. And when I went inside a while later, leaving him on the porch, I wasn’t scared he was going to run away and I’d never see him again. I was just glad I got to spend the time that I did with him. I was glad he showed up when he did. I wouldn’t have gotten the quiet me time to take in everything if he had been there earlier. I didn’t realize what a distraction he was. A wonderful distraction, but a distraction nonetheless. Next time I see him, I’m going to pet him because I want to. And he wants me to. Not because I need to. He certainly doesn’t need me. And that’s a-ok.
I’m going to do it when I’m willing to focus on him instead of my own world. I won’t pretend I can multi-task, because I obviously can’t. He has to enrich my world, not become the sole focus of it. Maybe he’ll be there when I head out again. Maybe he’ll wait for me when I get back from my adventures. Maybe he’ll have moved on. No matter what the outcome, I enjoyed the heck out of our meeting and the time we got to spend together. Almost as much as I enjoy my quiet me time when he’s not around. And sleepy. Very, very sleepy. Oh- and I’m glad he wasn’t that loud, needy, whiny cat a few doors down. I ain’t got time for that b.s.